When the time rolls around each week to look at my family for a Saturday blog post, The Legal Genealogist loves finding something that’s a little out of the ordinary. And when the out-of-the-ordinary event is something I hadn’t known before, it’s even more fun. So it was a total joy to open up John Cardinal’s terrific On This Day program — an add-on to the primary genealogy program I use, The Master Genealogist — a couple of weeks ago as I was looking forward to today’s blog, and to see the events that all took place on the 28th of December. Mary Isabella was the eighth of the 11 known children born to my 2nd great grandparents, Gustavus and Isabella (Gentry) Robertson. She was born 6 January 1863 in Mississippi,2 so she was not yet 17 when she married Amos, a farm hand nine years her senior. Theirs was a small quiet wedding, with no formal photos and just a couple of friends as witnesses. As far as their children know, the fact that their wedding was the same day as Sam’s parents was just coincidence. 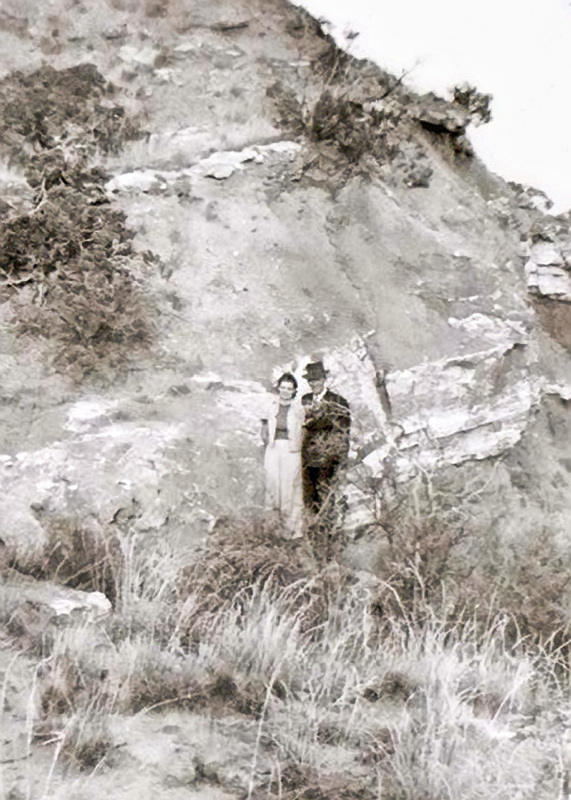 But the children do have one photo of their parents they believe was taken on their wedding day somewhere in or near Hall County. And remember that the beautiful bride here was the maid of honor in the photo from last week, and the bride there is the matron of honor here! 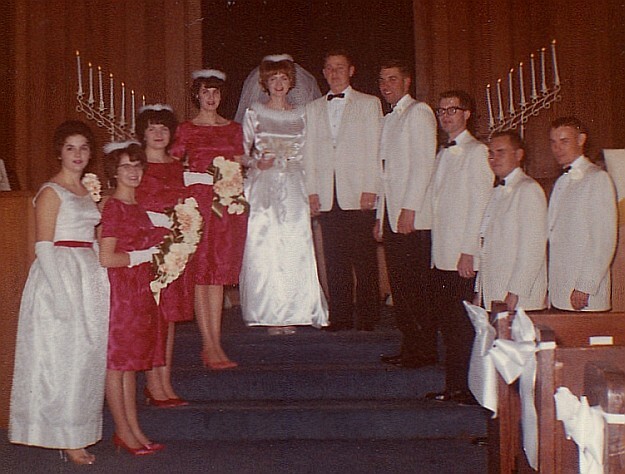 And if that’s not enough, Nedra’s and Mary Ann’s youngest sister Sue joined the family pattern when she married six years later, on 28 December 1968. 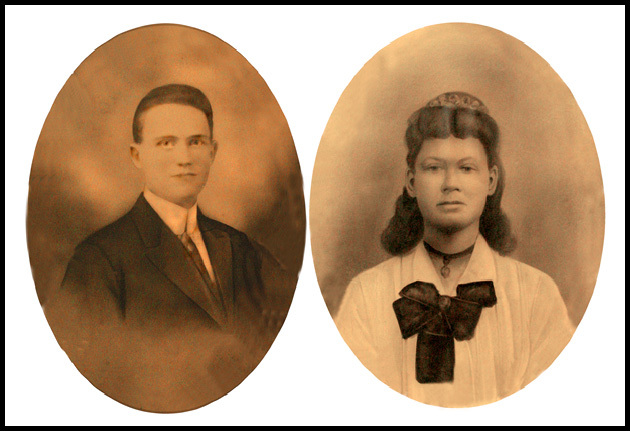 Not all of the family marriages lasted, but all contributed what any genealogist loves the best: more cousins! For Easy Abers — who fell in love with Nedra the first time he laid eyes on her in 1961 — didn’t make it to his and Nedra’s 50th anniversary. He died on May 20, 2004. He and Nedra had 41 years together and, she says, there will be a golden ribbon around the flowers on his grave this year. Love through the generations. It doesn’t get much better than that. What a neat use of On This Day! I use TMG and John Cardinal’s other program, Second Site, but you’re tempting me to get On This Day as well. Re the last photo: good marriages never last long enough. On This Day is donorware, Karla, so no excuse not to have it!!! John Cardinal does awfully good work. Beautifully done again, Judy! Thank you so much. Even though I’m intimately familiar with all of the information, I found my eyes filling with tears as I read it. These two stories of my family’s weddings, along with several others, will definitely go into the annals of my genealogical history! It’s such a sweet story, Mary Ann, and I’m most grateful to you and Nedra for sharing your part of it! I absolutely love, love, love the fur around the neckline of the bride’s dress – perfect for a December wedding! I can’t think of anything about any of the dresses that I don’t like, Sheri — especially that they were hand-made!